Pre heat your oven to 150°C. 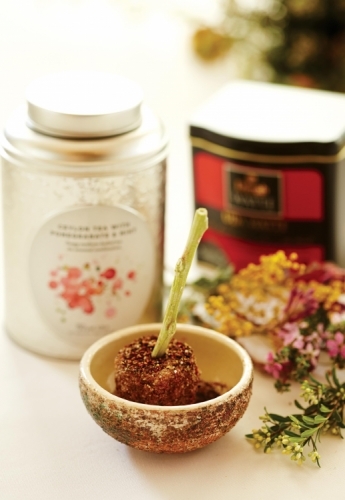 Infuse the beef stock with Uda Watte Tea. Place the wallaby shanks in an ovenproof dish, cover with the hot stock, seal lid tightly with tin foil. Braise in the oven for about 5 hours, till cooked and falling off the bone. Remove shanks from stock and flake meat finely with a fork then remove all bones and grit, chill. Make your chicken mousse with chicken, cream and egg white. Mix cold chicken mousse, flaked wallaby, herbs and Orange & Eucalyptus Tea, and season to taste. On a sheet of cling film, form into sausages and roll tightly, tying knots at each end. Poach sausages for 20minutes in a 60°C water bath and, when done, chill in iced water. Remove sausages from cling film, dust in flour, immerse in egg wash and coat in ground quinoa. Fry in oil at 180°C till golden brown, season with salt and more Orange & Eucalyptus Tea. Warm vinegar, infuse with tea and allow to cool. Strain. Combine tea infused vinegar, egg yolk and mustard. Add oil slowly whilst beating. Season to taste.